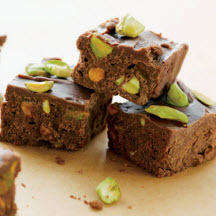 A decadent dark chocolate fudge made with delicious pistachios. Stir in marshmallows, chocolate, 1/2 cup nuts and vanilla extract. Stir vigorously for 1 minute or until marshmallows are melted. Pour into prepared baking pan. Sprinkle remaining 2 tablespoons of nuts over top of fudge; carefully press nuts into the fudge. Refrigerate for 2 hours or until firm. Lift from pan; remove foil. Cut into 48 pieces. Recipe and photograph are the property of Nestlé® and Meals.com, and is used with permission.